The Dot and the Line: A Romance in Lower Mathematics (ISBN 1-58717-066-3) is a book written and illustrated by Norton Juster, first published by Random House in 1963. The story was inspired by Flatland: A Romance of Many Dimensions, in which the protagonist visits a one-dimensional universe called Lineland, where women are dots and men are lines. In 1965, the animator Chuck Jones and the MGM Animation/Visual Arts studio worked with Norton Juster to adapt The Dot and the Line into a 10-minute animated short film for Metro-Goldwyn-Mayer, narrated by Robert Morley with the narration almost verbatim to the book. 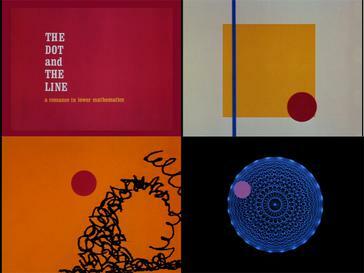 The Dot and the Line won the 1965 Academy Award for Animated Short Film. It was entered into the Short Film Palme d'Or competition at the 1966 Cannes Film Festival. The cartoon was released as a special feature on The Glass Bottom Boat DVD in 2005. The cartoon is also featured on the 2008 release of Warner Home Video Academy Awards Animation Collection and the 2011 release of the Looney Tunes Platinum Collection: Volume 1 Blu-ray box-set on the third disc as a special feature. In 2005, Robert Xavier Rodriguez made a musical setting of the book for narrator and chamber ensemble with projected images, and in 2011 he made a version for full orchestra. The Dot and the Line served as the inspiration for a collection of jewelry by designer Jane A. Gordon. The short film also inspired The Dot and Line, a blog that publishes essays about cartoons and interviews with voice actors and creators like Fred Seibert, Natalie Palamides, and Brandon Vietti. This was one of only two non-Tom and Jerry animated short subjects to be released by Metro-Goldwyn-Mayer post-1958. The other one is The Bear That Wasn't, released in 1967 as the last-ever MGM animated short. "The Dot and the Line" won the final award for an animated short for Metro-Goldwyn-Mayer, and Chuck Jones' only award as a producer. This would be one of two Juster books to be adapted for the big screen by Chuck Jones, although Juster had no involvement with the other, The Phantom Tollbooth. Unlike other MGM Cartoons from 1963–67, the lion in this film is Leo. ^ "The Dot And The Line". Big Cartoon DataBase. 2012-12-16. ^ "Festival de Cannes: The Dot and the Line". festival-cannes.com. Retrieved 2009-03-08. ^ "The Dot And The Line at Jane A. Gordon's Facebook page". 2013-04-03. ^ "The Dot and Line". The Dot and Line. Retrieved 2016-10-05.